The FEBRUARY MVYFL Monthly Meeting at the GREENVILLE SENIOR CENTER is at 8:00 PM. !!!!!! !CONGRATULATIONS - D2 WARRIORS - 2018 SUPERBOWL CHAMPIONS!!!!!!! at our new website www.minisinkyouthfootball.com. Please be aware, we will accept no registrations from returning players/cheerleaders after the June 30, 2019 deadline. We will not be fielding a D3 football team this season, but, D3 aged cheerleaders are encouraged to sign up! As you go through the registration process you will see that many of the question are also a direct link to the form that needs to be filled out. Click the question and the form will pop up. Fill out the form with Adobe or by hand and upload right back onto the website. Size charts have been included for all required uniform components. If you have an account already, say from Little League or Holy Cross Basketball you should be able to log in with that instead of having to make a new account. You will need to reenter some information as the account is the same but the sports are different. Below is the link. It will take you directly to the "Available Programs - Registration" page on the website. A good night of fun for the girls! At the February Meeting, We created and filled some new Board positions, the Original 7 Members, will remain the Executive Board. VICE PRESIDENT - GENE IANNUZZI, JR. Select your product and then your Design. Create, Customize and Show Your Pride! Soon to have Our MVYFL Logo! Superfast Turnaround, Most Orders Ship in 3 Days! You can also get to Our Shop by simply using the link in the Pages Pull Down Menu at the top of Our Site. At this year's FRIDAY NIGHT LIGHTS Skills Challange, we smashed the attendance record with over 180 competitors! As I MC'd the event from the announcer's booth, I was overwhelmed with the sea of youth players, their parents and coaches, who flooded the field for a great night of fun. With the smoke from the grill and the smell of hamburgers and hot dogs in the air, it had the feeling of a backyard family BBQ. I firmly believe that the bond between the Youth Football Program and the High School Program has grown stronger than ever. Talking to alot of youth coaches that night, I heard about all the great things that they are doing with their teams and I can't wait to see them play this fall! 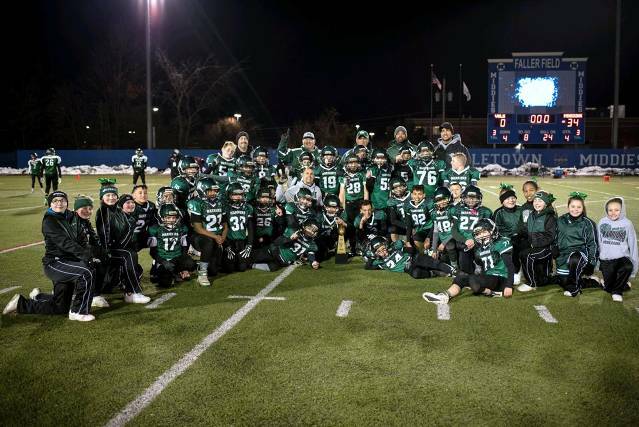 I am very proud to be Head Coach at Minisink, because of the support we have from all the people in the community. I would also like to thank all the Boosters, Varsity Players and Coaches for organizing and working the event. The people of Minisink are the backbone of the program and I can't thank all of you enough for everything you do. MV Youth Cheerleading Camp in July! What a great turn out of our Warrior Youth Cheerleaders, We hope you all learned alot and a great experience! Each division worked hard all week to put together a complete routine for the last day's performance for their families. These performances were AMAZING and really showed how hard everyone worked together as a team... "Singing in the Rain was so much fun too! Thank you to all of the parents and families who came to watch. 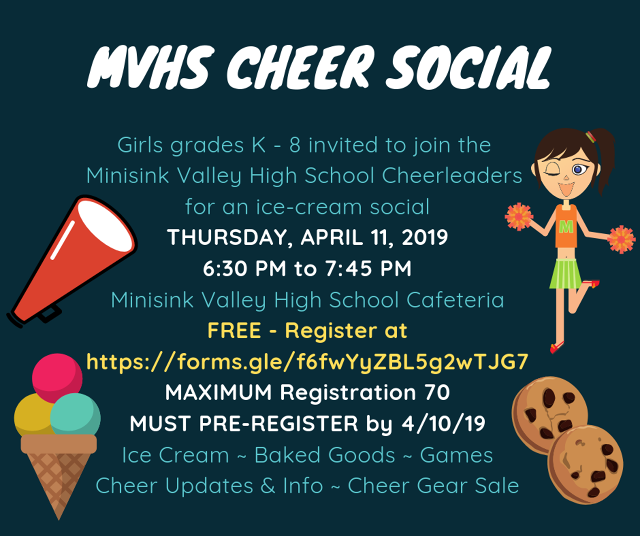 And for your continued support of the Minisink Cheerleading and Football Programs!!!! To all the coaches and cheerleaders who attended the recent Stunt Clinic, We hope learned and enjoyed the things you were taught--you all worked very hard and it shows! We had a great time and hope you did too, we'll see you during the season, I'm sure! where the people renting them have been and have not been able to use them, because they have been taken up by people coming to games. In one instance, the person that had the approval to use the pavillion on a game day, was verbally abused by people in the MVYFL Family. just as the Town lets Us use the football field, other people have the right to enjoy their gathering. WILL BE TICKETED AND TOWED! If the lot near the field is full, there isplenty of extra parking in the field across the street or down by the pavillion. Also, there is no alcohol or smoking permitted at the field! new additionto the Main Menu at the left.